In honor of Jack “King” Kirby’s birthday I have decided to feature 10 of my favorite covers (although I cheated with Young Romance #17 and used a splash). Well my favorite covers today; if I were to make a list tomorrow it probably would include a different set except perhaps for Treasure #10 which always seems to be one of my favorites. Of course Jack would go on to do many great covers after the Simon and Kirby collaboration ended but I am sure others will provide examples of those (hey after all this is the Simon and Kirby Blog). Somewhere around February 1940 (calendar dates) Joe Simon left his position as editor for Fox Comics and became Timely’s first comic book editor. It would seem that the first thing Joe did on arriving at Timely was to produce a new title, Red Raven Comics (August 1940, cover date). My understanding is that until a salaried position was arranged for Jack Kirby, he stayed at Fox. Perhaps that is why the title feature of Red Raven was done by another artist, but Jack would do the cover and some backup features (Early Jack Kirby, Chapter 5, Timely and the Red Raven). It was a very imaginative cover showing the Red Raven rescuing a damsel in distress. It looks like a scene from some medieval castle and for good reasons. Kirby’s cover was clearly swiped from the popular Prince Valiant syndication strip. This is not new information that I am presenting here as my understanding is that the swipe was reported a number of years ago in Robin Snyder’s newsletter. I have not seen this particular newsletter but Joe Simon discussed it with Carmine Infantino and me around 2000 or 2001 so it should have been prior to that. Joe remarked that originally the Red Raven cover was attributed to Kirby but when it was found to be swiped from Hal Foster some now said it was by Simon. Joe was complaining about the attitude, pretty common at the time, that Jack would never swipe but Joe always did. Hopefully that false concept has been put to rest by the discovery of a number of swipes that Kirby did from various sources, many of them discovered by the diligent efforts of Kirby scholar Tom Morehouse. 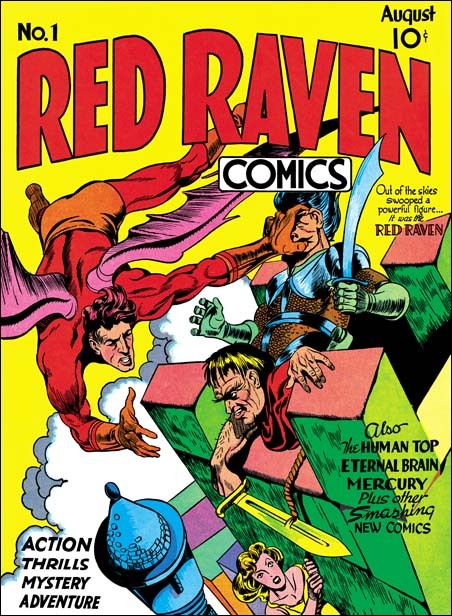 In the case of the Red Raven cover the drawing style leaves no doubt that Jack was the penciller. By the way when Joe made the remark about the newsletter Carmine asked “But Joe did you swipe”? Joe answered, “Sure, back then everybody did”. It is interesting that Jack used a newspaper comic from about 2 years prior as material to base the Red Raven cover. Although Prince Valiant was very popular, I do not think it had yet been reprinting as a book. That meant that Kirby had kept at least this particular strip for some time. One normally does not think of Jack Kirby as a fanboy but it appears he was, at least for Hal Foster. Of course that was all when Jack was very young; surely he wouldn’t do something like later in his career. Would he? 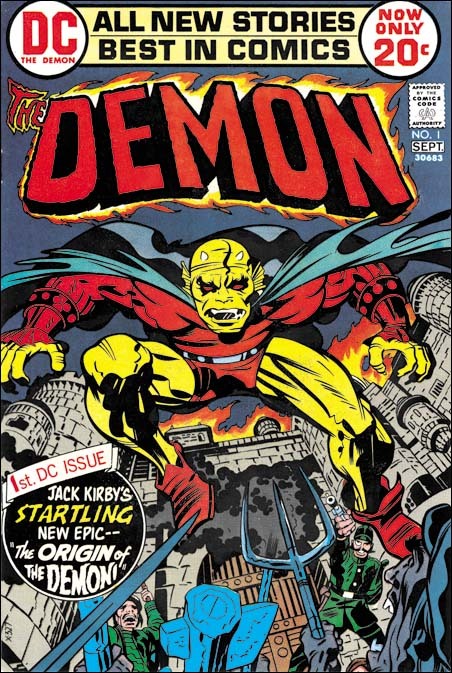 Mark Evanier wrote a foreword to DC’s reprint “Jack Kirby’s The Demon”. Mark is such a marvelous writer and Kirby scholar that all of his introductions are great, but this one is particularly special. In it describes Jack creating and outlining the first issue of the title, The Demon, over the course of a family outing to a restaurant. On his return Jack would pull out a reprint volume and declare he would use it to model the new character as a sort of inside joke. You guessed it; it was a reprint of Hal Foster’s Prince Valiant. Over twenty years later and Jack still was a fanboy! 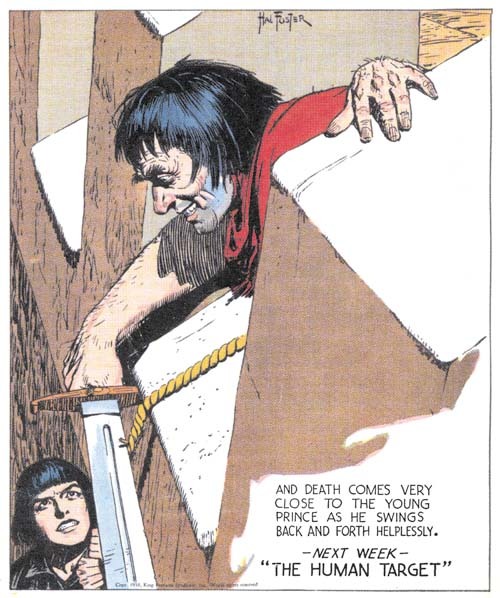 Both Prince Valiant images that I used above come from a new reprint volume by Fantagraphics (Prince Valiant, Vol. 1: 1937-1938). This is a gorgeous volume with coloring that is absolutely breath taking. I highly recommend it. Simon and Kirby were now producing 3 monthly titles (Young Romance, Young Love and Black Magic). Black Magic had recently become a monthly (chapter 4 of Little Shop of Horrors) a certain indication that the title was a commercial success. There is also reason to be sure that the two romance titles were also still popular for a reason that will be discussed in the next chapter of this serial post. Mort Meskin’s output for the period covered in this chapter has dropped significantly from the amazing 104 pages that he supplied for the duration covered in chapter 18. Still with 59 pages, Mort was by far the most productive artist working for Simon and Kirby at this time. 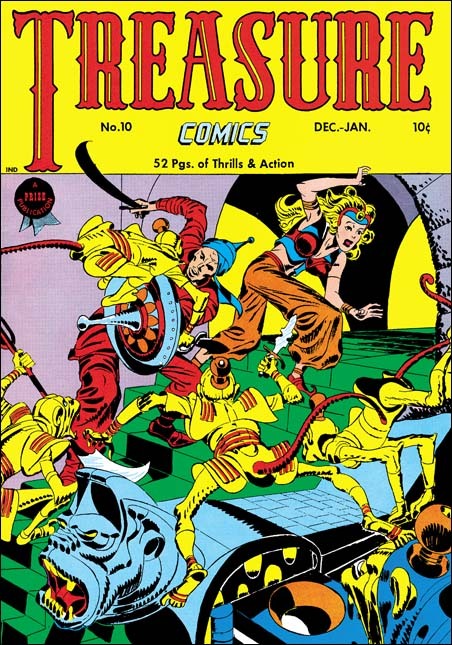 The second and third most productive artists were Bill Draut (37 pages) and John Prentice (33 pages). 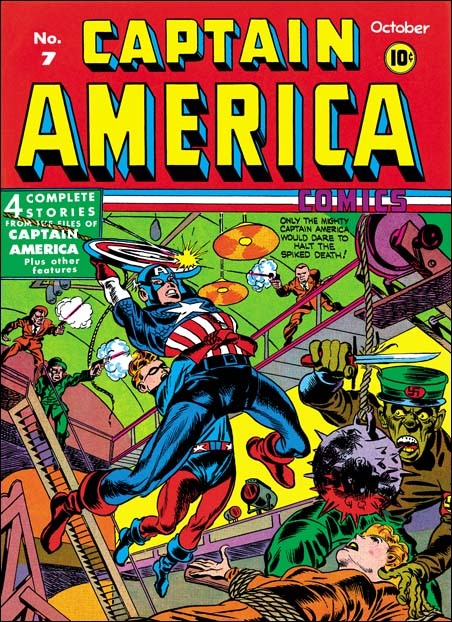 Surprisingly Jack Kirby only takes the fourth position (24 pages of art), beating out only the more minor artists used. Meskin’s decreased output was largely made up by the use of at least four other artists. There really is nothing to distinguish Young Romance comic from Young Love. The two titles ran the same type of stories using the same mix of artists. The only exception was that there was a distinct tendency for Jack’s art to appear in the flagship title Young Romance rather then in Young Love. During this period Kirby only drew three romance stories and they all appeared in Young Romance. Jack also typically did the lead story when he appeared in one of the romance title. But not always as for example YR #47 where Kirby did a backup story. 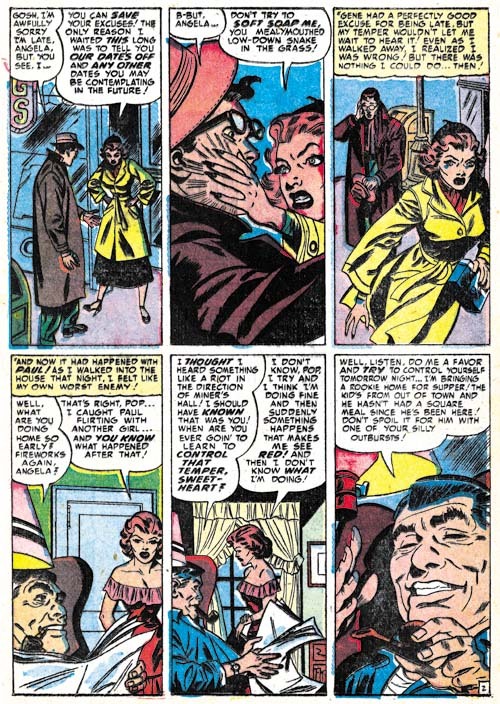 While Mort Meskin supplied most of the romance art during this period, it was to Bill Draut that Simon and Kirby generally turned when Jack was not going to draw the lead feature. For this period Bill did 3 lead stories compared to 2 by Jack (with the remaining one done by John Prentice). The splash for the lead story was second only to the cover for grabbing the potential buyer’s attention. Other genre could turn to action to capture the viewer’s interest but that really was not appropriate for romance. 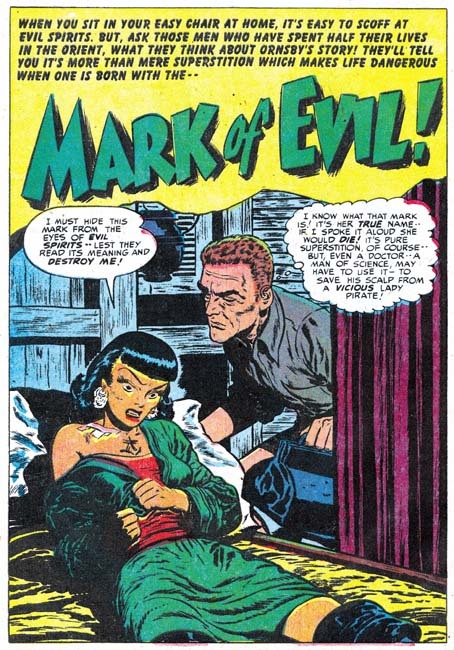 Among the studio artists, Bill was second only to Kirby in providing the splash with visual clues and nuanced emotions that took the place of action. 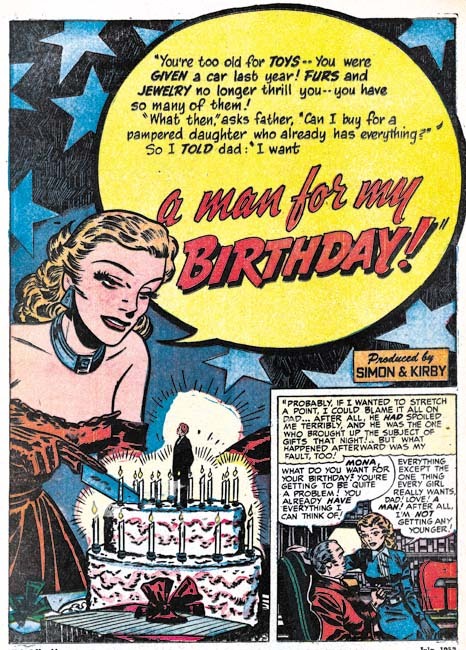 “A Man for My Birthday” is listed in the Jack Kirby Checklist as drawn by Kirby and inked by Draut. 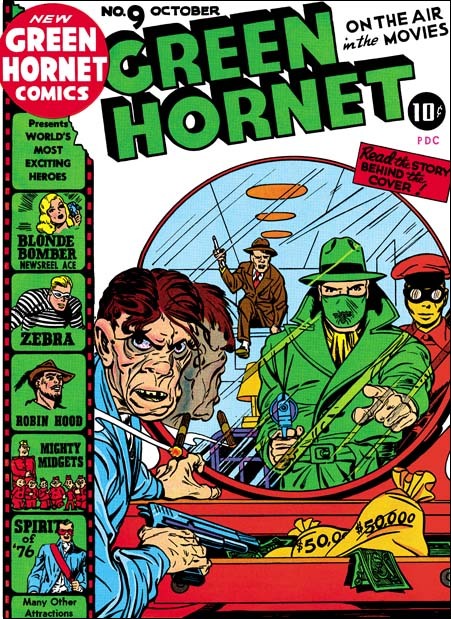 Without doubt this is in error and Bill Draut did both pencils and inks. I like to include at least one image by each of the major artists in my post for this series and I could not resist this one by Mort Meskin. It still is not clear to me whether the studio artists were just following directions from the scripts or did they devise their own compositions. I will return to this subject below, but here I would like to say that I have noticed that humor shows up in splashes by Meskin more often then any other artist with “Mind Your Manners” as a great example. 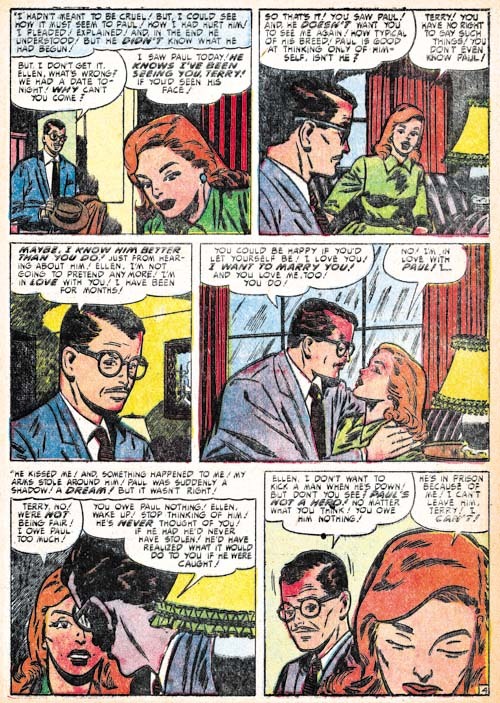 Action is not an often a component of romance comics, that is except for those by Kirby. Still it does show up in Simon and Kirby productions from time to time. I wanted to provide another example of a fight scene by John Prentice. Of course Jack Kirby was a master at the slugfest, but his fight scenes were done quite differently from the one in “Tenement Girl” leaving little doubt that John was not working from a Kirby layout. While George Roussos did some substantial work for Black Magic he was generally relegated to short pieces in the romance titles. Frankly this is understandable because George’s art tended to be a bit crude which worked well with the horror genre but detracted from love stories. However Roussos would occasionally get a more substantial romance piece with “Heart of Gold” the only work for this period that was greater then 2 pages. This story is the best romance work that Roussos has done so far and is actually quite nice. Perhaps George was getting a helping hand from Meskin, some of the faces look in part like Mort’s. I believe the primary reason for the improved appearance of the art is the use of a sparser inking. There is an exception to the lighter inking and that is for the man in the foreground of the splash. Note the shoulder blots and the use of picket fence crosshatching (Inking Glossary). These inking mannerisms are usually not found in worked in Roussos inking but they are typical Studio Style techniques. I suspect Joe Simon has stepped in improve the splash. But the rest of the splash seems to be inked by Roussos. Note particularly the inking of the background trees, a mannerism I do not believe I have ever seen in the Studio Style. There are 4 features, two of which are full stories, done by the same artist in the period covered by this chapter. This amounts to 17 pages of art; not a lot of work but enough to be a significant contribution. Further this artist had a story in Young Love #32 which was covered in the previous chapter. So it would really be nice to be able to identify who the artist was but unfortunately I have not much headway. One possibility is that this work was done by Al Eadeh, an artist that also did some work for Simon and Kirby back in 1949. At Ger Apeldoorn’s suggestion I have look at some scans of the artist’s work in Atlas Tales but either the image resolution was too low or the subject matter too different so that I was unable to come to any conclusions. Another artist that appears at this time is represented by a single work. I provide a story page because I felt that the splash did not adequately represent his style. I have to say there is something very familiar about this style but I am unable to say why. Added 8/28/09: In the comments Ger Apeldoorn suggested Bill Walton and without doubt he is correct. 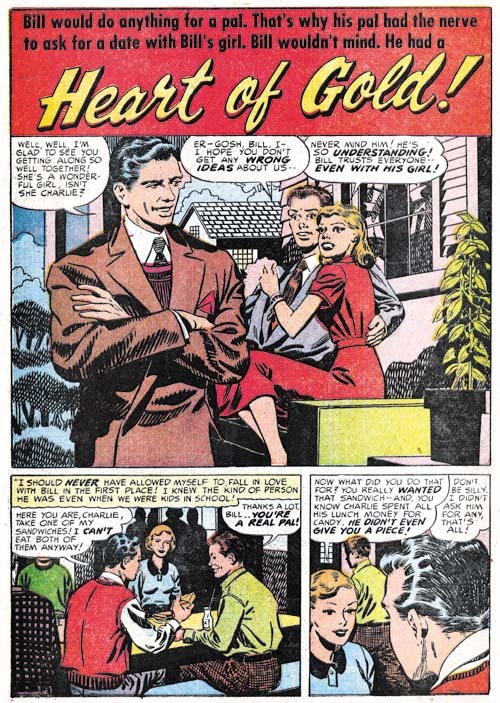 Young Love #33 (May 1952) “The Man around Her Home”, art by John Severin? “The Man around Her Home” also has a familiar look to it but in this case I can say why. 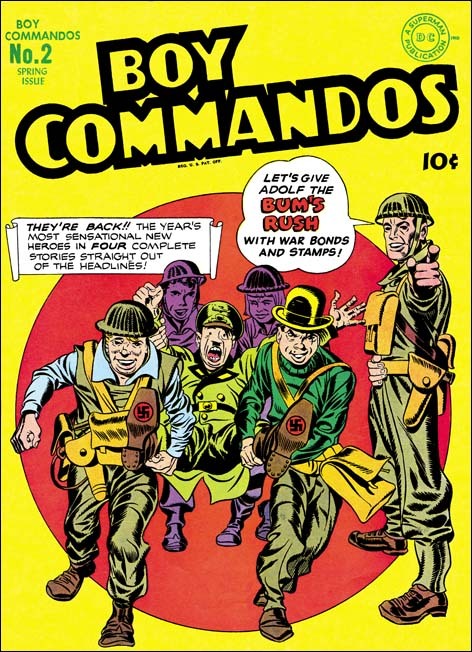 Some of the men (but not all) look like they were done by John Severin. There are differences between the art in this Young Love story and the work Severin was then doing in Prize Comics Western. Perhaps this was just the effect of a different genre or inker. 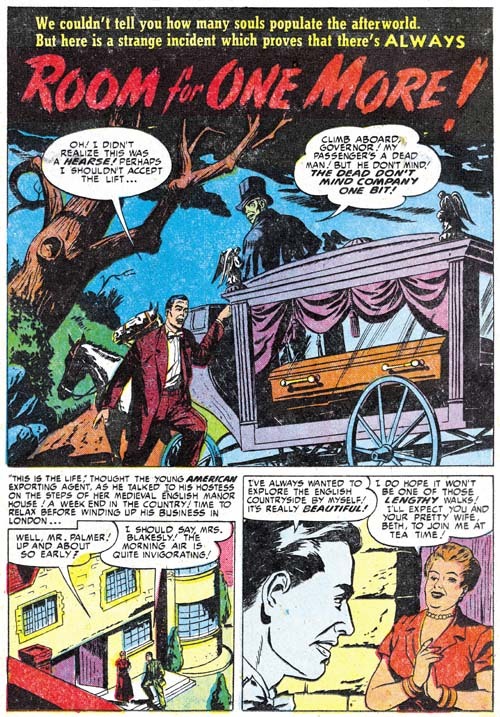 Severin has not appeared in a Simon and Kirby production since November 1950 but he was very active in Prize Comics Western. Ross Andru, who provided a single story for Young Love #26 (October 1951), returns to do two more features. While Andru was a talented artist who did excellent romance art he only did occasional work for Simon and Kirby. We will see him again, under different circumstances, in 1954. I have chosen a story page for an example of Andru’s work because it has the unusually panel layout of 2 rows with 3 panels per row resulting in tall and narrow panels. 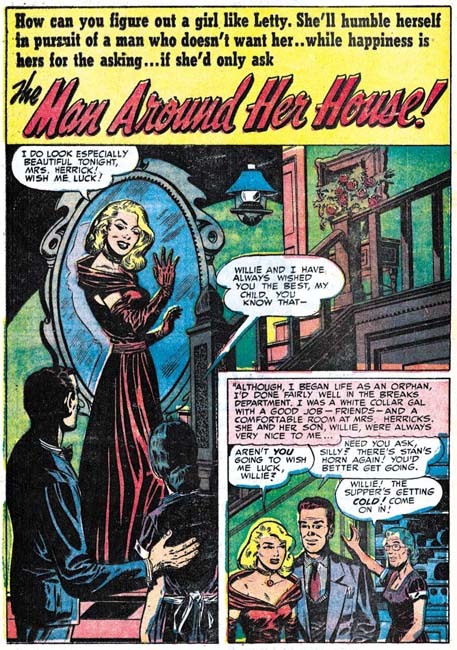 Among Simon and Kirby productions this layout was first seen to be used by Leonard Starr in romance work from 1949 and 1950. 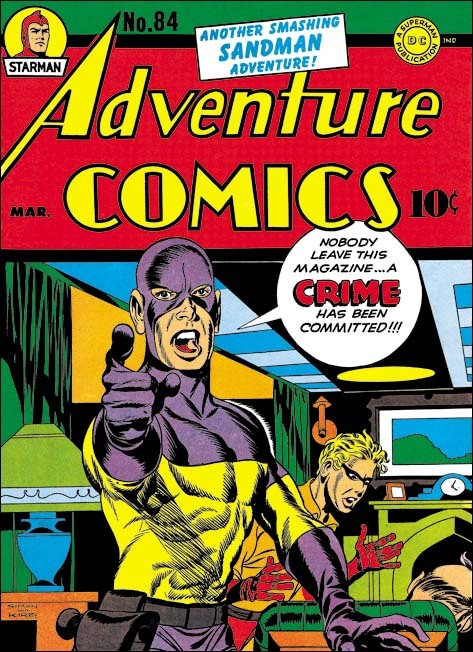 More recently it has shown up in work by first Mort Meskin and, then George Roussos, and now Ross Andru. There is a reason I am particularly interested in this panel layout other then the chance it provides to compare how different artists work with such narrow panels. When I began studying Simon and Kirby one of the declarations that some Kirby experts made was the Jack supplied layouts for other artists. However when I examined the various artists’ graphical story telling techniques with those used by Kirby I found little to support that supposition. Unfortunately such comparisons are very subjective and there were always others who disagreed with my observations. But panel layouts are more cut and dry and difficult to dispute. So when a particular panel arrangement appears in different artists but not in the work drawn by Jack himself, it is pretty good evidence that Kirby did not do the layouts. After all you would expect that Kirby would use the same type of panel arrangements for his own work as well as any layouts he supplied. But Kirby was not the only boss in the studio, there was Joe Simon as well. Joe has often said that he provided layouts to artists. This is well documented with later comics such as the Fly for Archie (where Joe’s collection includes some layouts that Joe Burgos did (Carl Burgos does the Fly) but that does not necessarily mean that it was true throughout Joe’s career. 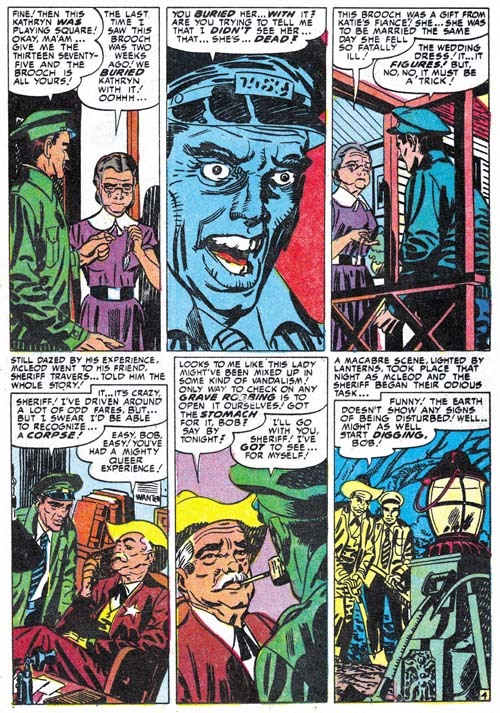 Unfortunately it is not possible to compare the layouts of Joe’s own drawing with that by other studio artists because Joe had not done any published art since the “48 Famous Americans” one shot for J. C. Penny in 1947. Now, however, we have seen this unusual panel layout first appear in work by Meskin, shortly followed by Roussos and now Andru. While it seems reasonable Meskin could have picked up the layout himself and Roussos copied it from him, I find it harder to accept that Andru, who did not actually work in the studio, independently picked up the panel arrangement. So I am now considering the possibility that it was Joe that started to use it in layouts supplied to other artists. This is by no means a “slam dunk”, just something I will be considering as I continue working on this serial post. As I said above, Simon provided layouts to artist later in his career. The layout that Joe had Burgos do were very rough sketches including rough balloons. Joe used a somewhat different layout technique for Sick. There Simon provided the artist with inked panel borders and finished lettered balloons but without even sketches for the art. Either of these techniques could have been used during the Prize year (assuming Joe was in fact supplying layouts). I cannot supply sales figures so I have to look for other indications for how popular Simon and Kirby titles were. Fortunately Simon and Kirby had a modus operandi when it came to releasing new titles (actually it may have been the publishers who were responsible). 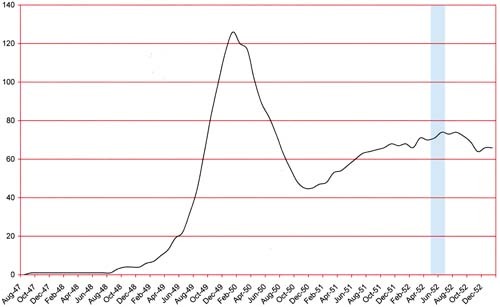 New titles were released as bimonthlies but if after a period the titles sales seemed to warrant it the title could become a monthly or a new title of the same genre would be created. Black Magic had been a bimonthly for 16 months when it was converted to a monthly. Thus we can safely conclude that sales of Black Magic were good at least at this point in time. 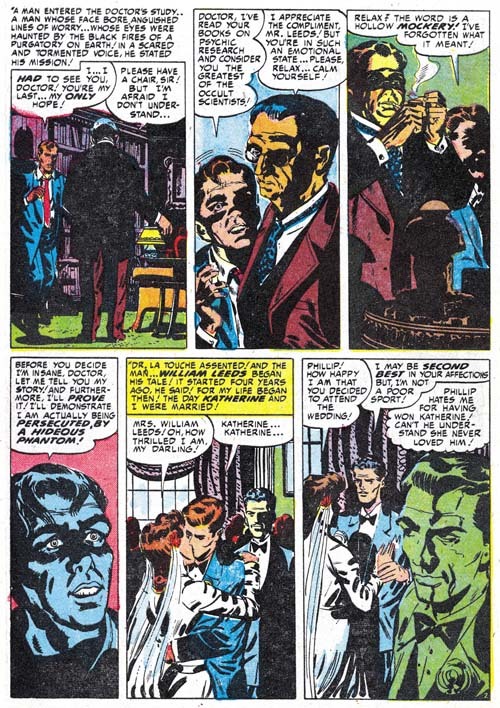 As was true with the concurrent romance titles (Chapter 18 of The Art of Romance), Jack Kirby was producing less then his normal amount of pages of art with most of the work being done by Mort Meskin. In one respect Kirby still was the most important artist in that he did all the covers and the lead story for the two issues (#10 and #11) of the three covered in this chapter. But in terms of number of pages of art, Jack did only 18 pages as compared to the 34 pages done by Mort. After Mort and Jack come George Roussos (14 pages) and John Prentice (13 pages). Four other artists only supplied a single story; Marvin Stein (8 pages), Bill Draut (7 pages) and two unidentified artists (4 and 5 pages). While Kirby may not have done as much art as he had a year or so ago, what he produced was still top rate stuff. 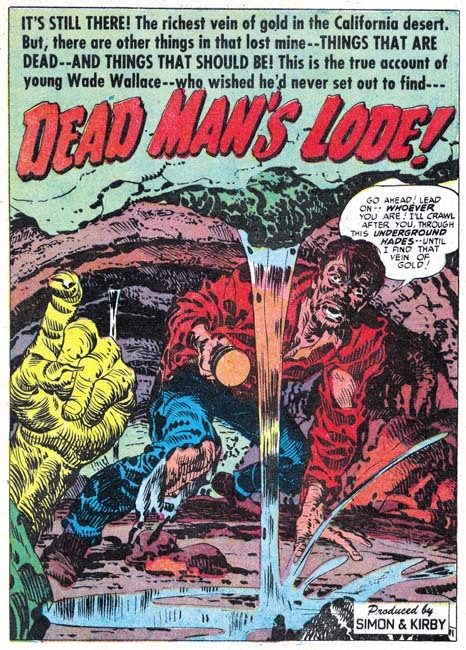 The splash for “Dead Man’s Lode” is a particularly engaging image. Not much in it just a man struggling through a tunnel and a hand beckoning him on. But of course such a simplistic description hardly does justice to what Jack drew. Kirby often brought interest into what for another artist might have been a banal scene. Here the drama is supplied by the man’s torn clothing, stooped posture and rugged features. I particularly like the way the pouring water divides the composition and how streaks of brushwork both suggest the optical distortions as well as the flow of the water. I could not resist providing another example of Mort’s use of tall narrow panels. Leonard Starr used them earlier then Meskin, and used the quite well I might add. But Mort’s use of narrow panels was very remarkable. I must admit as I review Mort’s work in Black Magic and the romance titles I cannot help but feel Meskin was more at home with the horror genre. You pretty much never see in Mort’s romance work such a well worked out close-up as in panel 2 but they are not very rare in Black Magic. 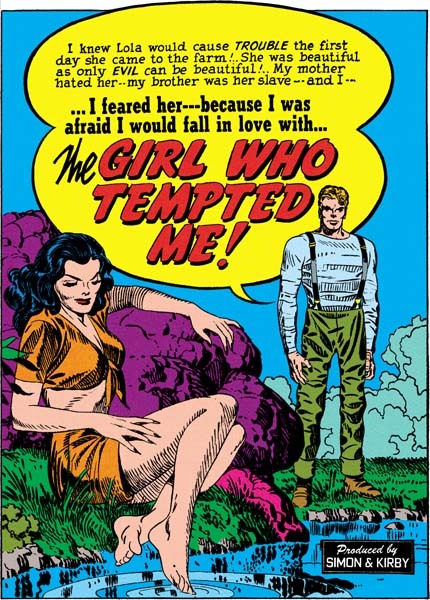 John Prentice did a lot of romance work for Simon and Kirby so it is easy to overlook his contributions in other genre. I find his art in Black Magic quite satisfying. 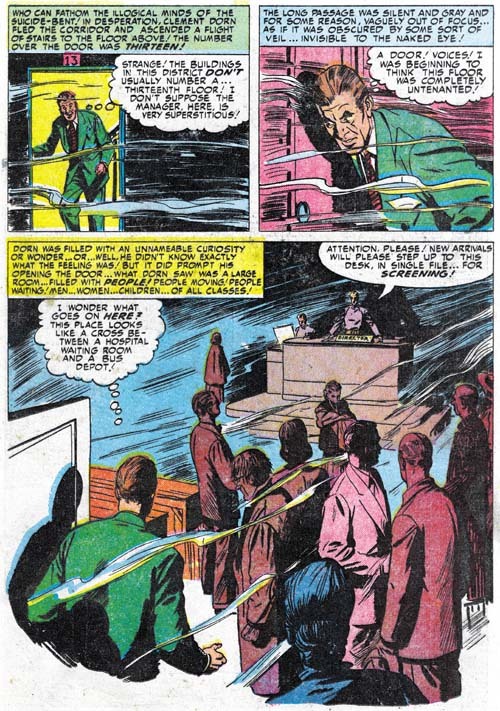 I have previously discussed “The Thirteenth Floor” (Alternate Takes, The Thirteenth Floor) and will not repeat it here other then to note that use of a splash-like story panel is unusual for Prentice. Despite what I feel is the high quality of his Black Magic work, John did not produce many stories for the title. Another Prentice story would not appear in Black Magic until 9 months later. A ruthless but beautiful Chinese pirate; what’s not to like despite being a somewhat predictable story. Draut seemed to relish the change of pace afforded by Black Magic from his frequent romance work. George Roussos appeared to get a greater portion of work for Black Magic as compared to the romance titles. Frankly he is not as talented as some of the other studio artists. His work has a certain crudeness that while quite acceptable in the horror genre detracts that from his romance art. Presumably that is why he is more often seen in Black Magic. Despite my criticism of his art, in at least on respect Roussos is quite effective and that is in his use of blacks. 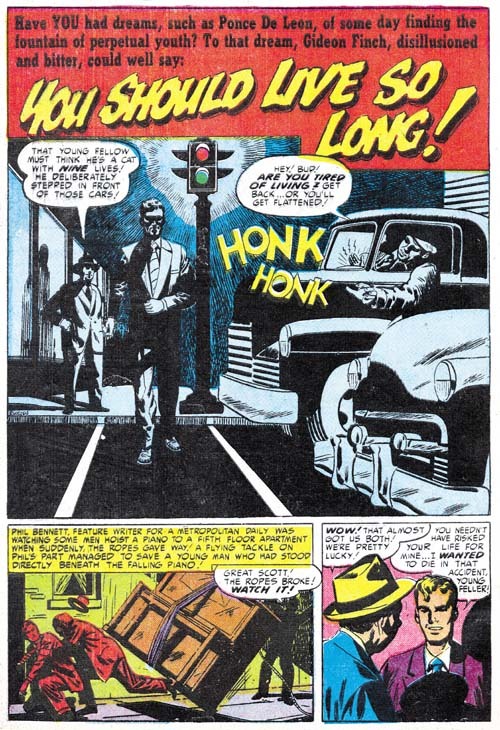 The splash panel for “You Should Live So Long” is a good example of George’s interesting use of shadows. I recently wrote about a story that while signed by Roussos looked like it was based on layouts provided by Mort Meskin (Art of Romance, Chapter 18). One of the things I noted in that story (“The Great Indoors”) was the use of tall narrow panels that Meskin was fond of using at that time. Well “Through All Eternity” also has a page with similar panels and so the question arises whether Mort did layouts for this story as well. While some of the faces in “The Great Indoors” looked distinctly like they were drawn by Meskin, I find no such overt Meskin drawing in “Through Al Eternity”. Further while three of the panels (4 to 6) of page 2 look like Meskin could have laid them out, the composition of the upper three panels seems inferior to Mort’s typical efforts. On a whole I am included to say that these are not Meskin layouts and Roussos was just trying to pick up some of Mort’s techniques. 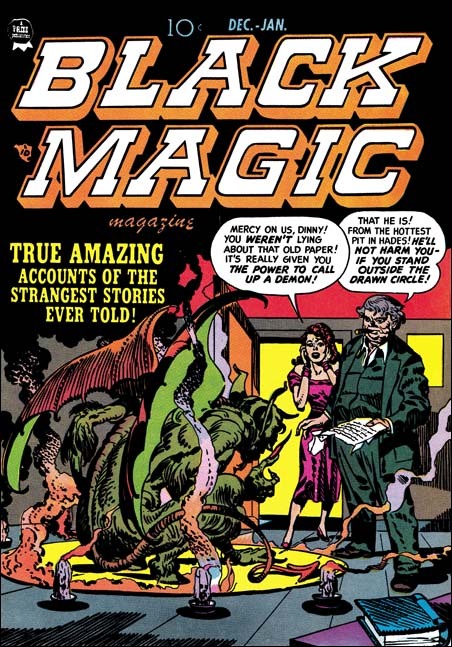 My database has 6 Black Magic stories drawn by Marvin Stein but they are all from the second run of the title (1957 – 1958). 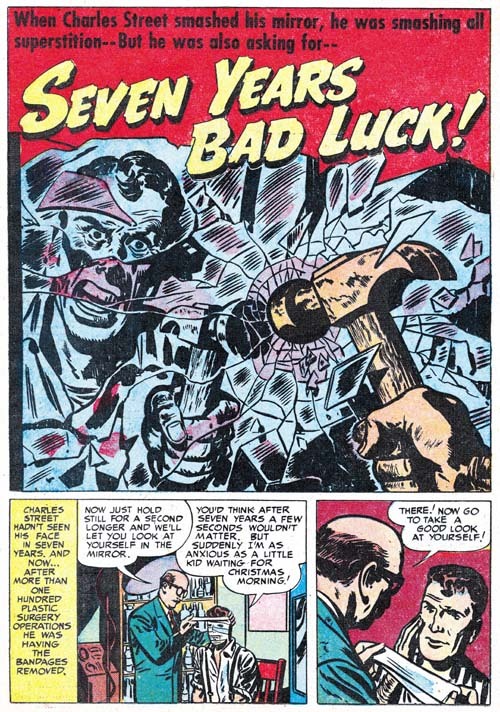 “Seven Years Bad Luck” is unsigned but there are quite enough examples of typical Stein drawing style, such as the man on the right in the last panel, that it can confidentially be attributed to Marvin. 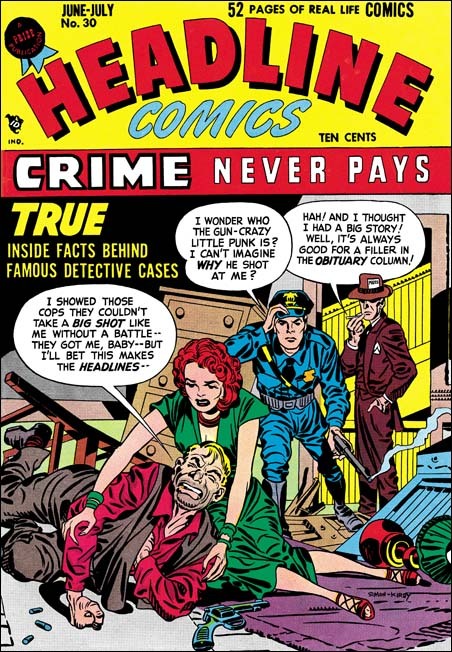 By this time Stein was only occasionally providing work for Simon and Kirby productions but he was very active in Prize crime titles (Headline and Justice Traps the Guilty) having in fact become the primary artist. 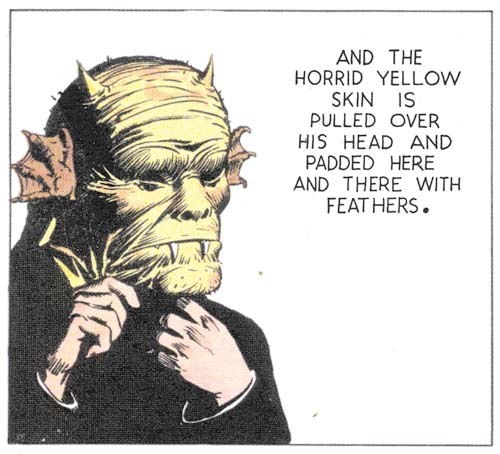 Stein also made appearances in Prize Comics Western although not nearly as often. Marvin had developed a style very suited for the crime and western genre, and he puts it to good effect in this Black Magic tale as well. 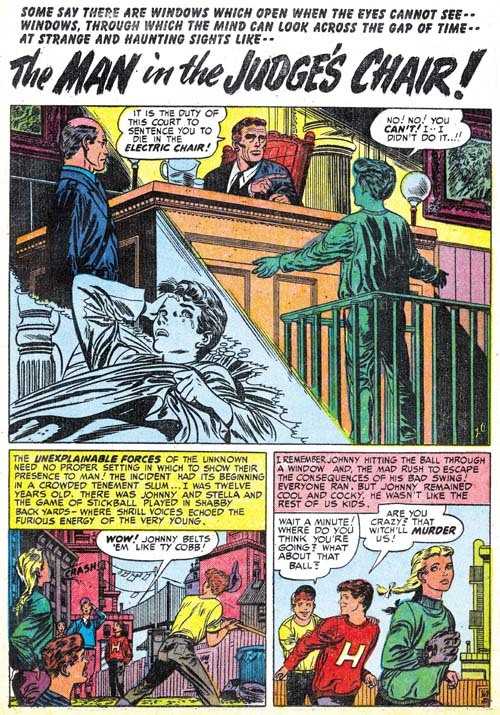 Black Magic #9 (February 1952) “The Man in the Judge’s Chair”, art by J. G.
I am completely unfamiliar with four of them and so I will have to do more research. 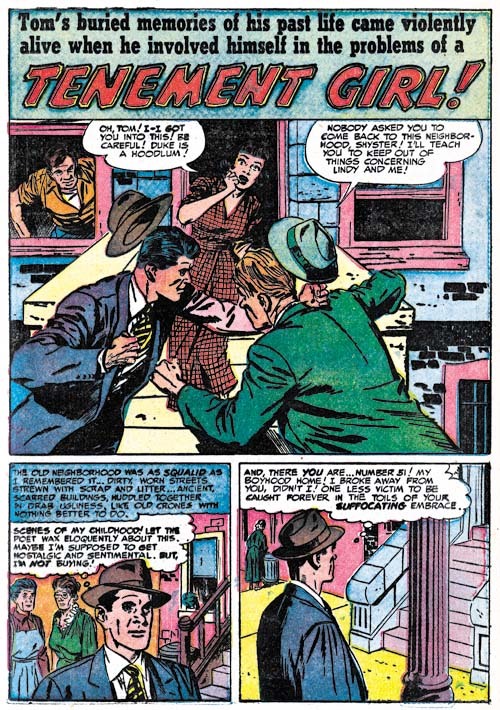 John Guinta did some work for Simon and Kirby in 1949 (chapter 9 of Art of Romance and chapter 7 of It’s A Crime) but unless his style has changed considerably he was not the artist. Jerry Grandenetti worked with Joe Simon in the 70’s and his comic book career actually goes back far enough. I have not seen much of Grandenetti’s early work and will not rule him out entirely but I do not think he is a good match either. My database shows Joe Gevanter as the artist for a story in Prize Comics Western #104 (March 1954) but I now question that attribution. The piece is signed Gevanter and Severin and that order usually means Gevanter was the penciller and Severin the inker but it seems odd that Severin would ink another artist work when he generally did not ink his own pencils. Further the drawing style is so close to Severin’s that either John’s inking completely overwhelmed Joe’s pencils or in fact Gevanter was the inker to Severin pencils. 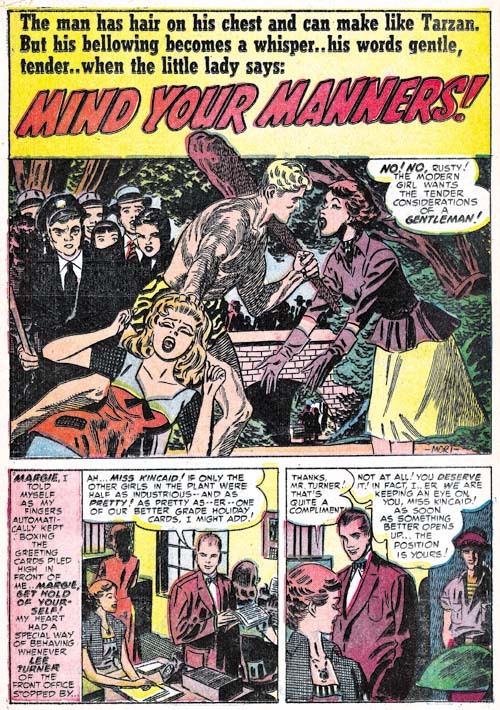 Currently I accept the latter deduction and I have found no indications that Gevanter penciled any other comic book so I do not consider him the artist of “The Man in the Judge’s Chair”. The other unattributed story is “Room for One More”. Again the art really is neither bad nor great but it would be nice to know who drew it. Unfortunately at this time I cannot even offer a suggestion. I recently posted on a couple of stories Simon and Kirby did for Prize Comics early in their collaboration (Ted O’Neil). 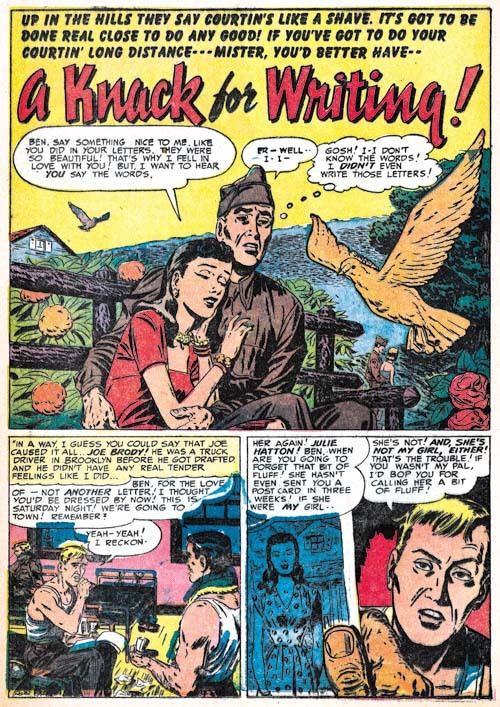 Flying stories were not a big part of Simon and Kirby repertoire (but see The Milton Caniff Connection) and so I thought I would write about an earlier pilot story, Wing Turner from Mystery Men #10 (May 1940). I had previously written about this story (Early Jack Kirby, Chapter 2, Working for Fox) but my emphasis was on Kirby characterization and not on the flying. 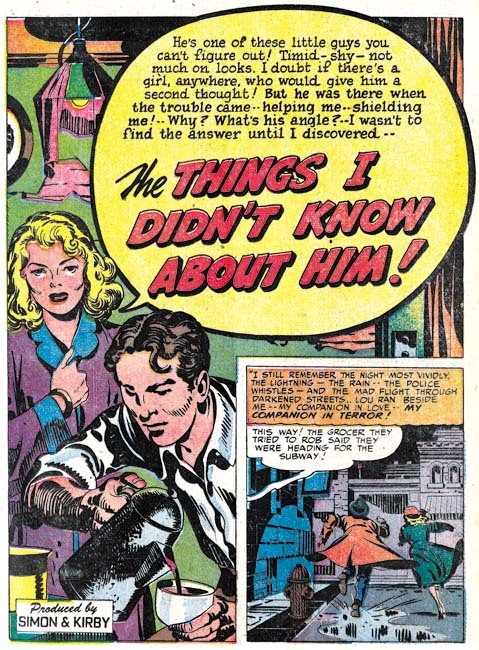 This Wing Turner story and another feature for Science Comics #4 were done at about the same time that Jack first met Joe Simon. Joe had just joined Fox as their first editor. Previously Fox Comics used Eisner and Iger to produce their comic books but that outfit was dropped and Simon was hired to set up a bullpen. It was a difficult task and one technique used was to advertise for Iger and Eisner artists that had previously worked on the comics (most signatures in the comics were aliases). As I said, these two features from May were the only work the Jack did for Fox comic books. Kirby’s primary job at Fox was the Blue Beetle syndication strips the earliest of which was dated January 8. 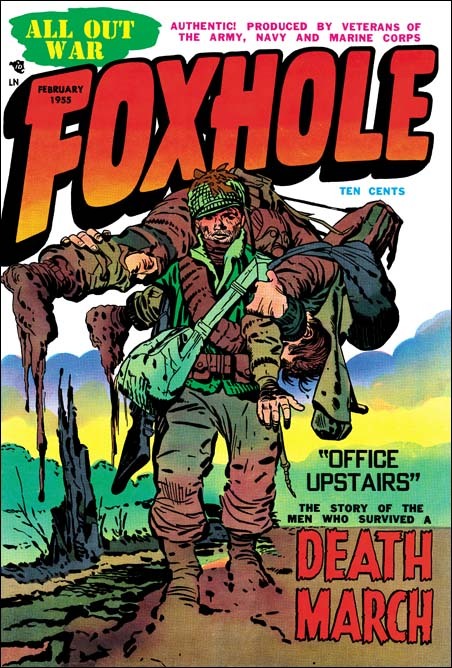 This may seem to greatly predate the two Fox comic book features but that is misleading because of the way the two publication forms released. Uncolored syndication strips were typically created about 4 to 6 weeks before publication but comic books were cover dated about two months later then their actually release date. Further for comic books it typically took a month or more to create the art, a month for the printer and a month for the distribution. This meant that the work on a comic book started 5 or 6 months before the cover date. Do the math and you will find that the Blue Beetle syndication strip was done about a month before the 2 comic book features. However there is a caveat to this calculation; the initial work for a previously unpublished syndication strip is often done even further weeks in advance to give it time to be marketed to different newspaper publishers. So Jack was already working at Fox when Joe arrived, if only for at least month or so. Frankly most of the Fox artists, or at least the ones who provided work after Fox stopped using Eisner and Iger’s studio, are rather uninspiring. Even though Kirby had not yet reached his full potential, he still seemed a much better artist then anybody else that appeared in the Fox comics. Why only two features and why only when Joe Simon just started? Didn’t Joe not like Jack’s work? Well we can confidently say that Joe admired Jack’s art right from the start since he would very shortly have Kirby helping with Blue Bolt, a feature for another comic book publisher. Probably the problem was the Blue Beetle syndication strip that Kirby was working on. Victor Fox had managed to get the Blue Beetle on the radio and probably had high hopes to succeed with it as a syndication strip as well. At the time syndications trips were big money, assuming the strip was picked up by enough newspapers. So Victor Fox would likely have wanted Kirby to devote his time to the Blue Beetle strip. However Fox probably relented to Kirby doing comics as well for the May issues because it simply was not possible for Simon to find artists quick enough. Once the bullpen was set up it was back to Blue Beetle strip for Jack, or at least as far as Victor Fox was concerned. Kirby did not let that stop him because he had already started moonlighting for another comic book publisher. The Simon and Kirby collaboration had not yet formed so Wing Turner was strictly a Jack Kirby piece. Even more so because Jack not only penciled it but also did the script, lettering and inking. Of course even at this point Jack was doing top rate art. Still the Wing Turner work is just not nearly as exciting as the Ted O’Neil stories done just 7 months later. Partly this was due to the different plots and the very short length of the Wing Turner story (3 pages), but part was that Jack’s just got better even in such a short period of time. Note the use of both close and more distant views. However, while we can see the pilot in the last panel we cannot see his face. 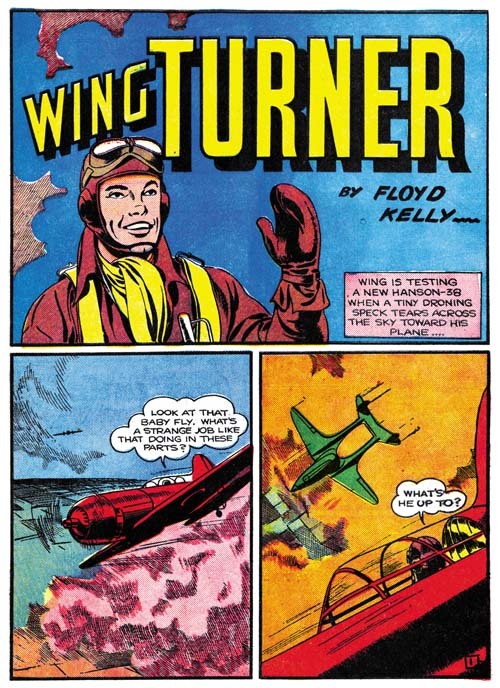 This may have been more realistic, but the use of expressions in Ted O’Neil was one of the devices by which Kirby was able to add excitement to the aerial scenes. We started talking to Joe Simon himself, and met with him and his attorney Ted Kessler, and then the conversation went to Lisa Kirby and Lisa’s attorney Paul Levine. From there, it’s just been a very long conversation. It is true that Mr. Barrucci started with talks with Joe Simon, but Simon turned down Dynamite’s proposal in no uncertain terms. Apparently Mr. Barrucci did not know the meaning of the word no and he proceeded anyway. Joe only found out the supposed deal when it appeared on Comic Book Resources. 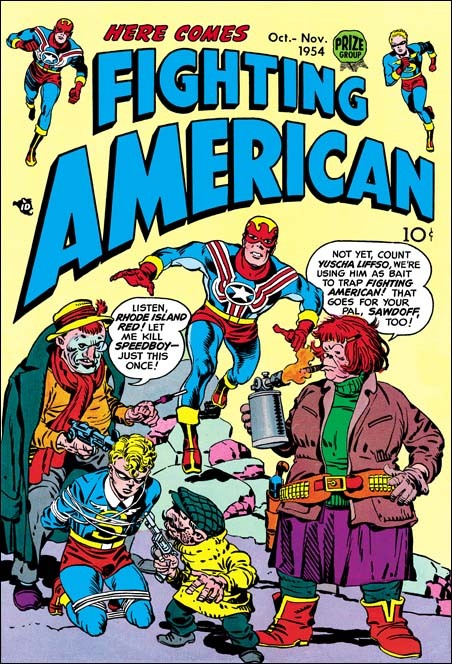 There are some penciled covers of Fighting American by Mr. Ross that are printed in the story without copyright notice. I find that damaging, as is the whole fake story. Newsarama also spoke with Lisa Kirby Monday afternoon, who informed us the Kirby estate will no longer be participating in a Fighting American project at Dynamite.